It’s official! Date & location announcements for the 2nd Annual Cleveland Big Wheel Relay! YES, we will be having our 2nd annual event next year. YES, we will be doing it again in Shaker Square… once again as the kick-off event in the Shaker Square summer series. And, YES, (if you can’t tell) we are super excited about it! It’s practically the same day as it was last year… Saturday, June 14. It was such a perfect day last year, so why fix something that’s not broken? What is the Cleveland Big Wheel Relay? 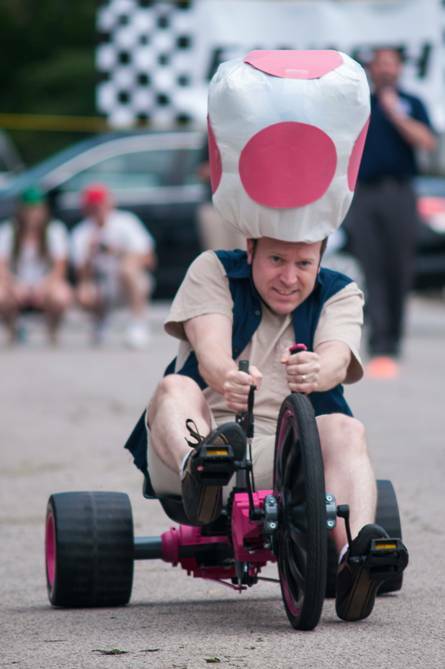 In case you weren’t there last year, our first Cleveland Big Wheel Relay was an amazingly fun day where 30 teams of 4 relay raced in costumes on Huffy Green Machines in the heart of Shaker Square! We had food truck goodies, a beer tent, music, and a way-too-excited-but-hysterical local TV sports reporter as our emcee. It was pretty much the best day ever. For more details about the race itself, click here. What can you do right now to make sure you’re in on the fun? Get 3 other friends on-board for the race, and then head on over to our registration page and fill out the registration form! This is a highly exclusive event, and team spots are limited… first come, first served! Don’t miss out on the fun. As always, if you have any questions at all, want to volunteer to help, or want to sponsor the event, please send us a message on our contact page. We’ll keep you updated as we know more… until then, see you in June!